Our good friends recently bought a summer cottage on the coast of Massachusetts and my husband and I wanted to give them something memorable as a housewarming gift. We wanted to give them something, well, summery. I had been driving myself a little crazy trying to come up with just the right thing. 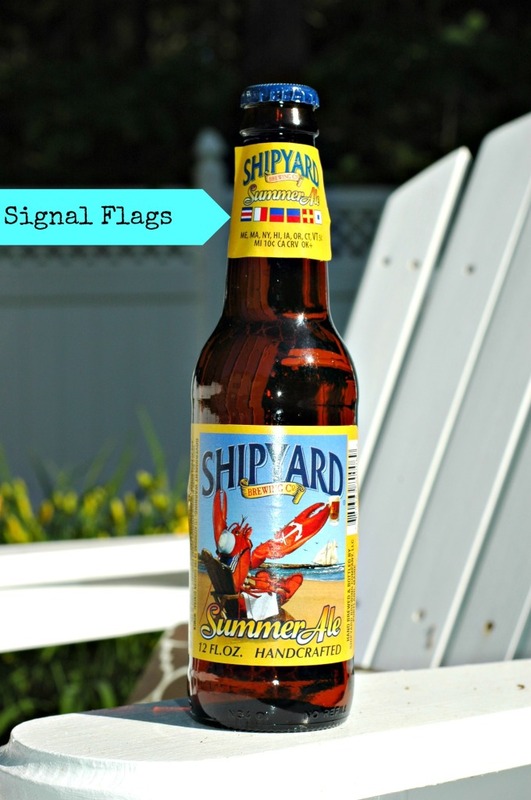 Little did I know that the idea would come to me as I was sipping on a Shipyard Summer Ale! 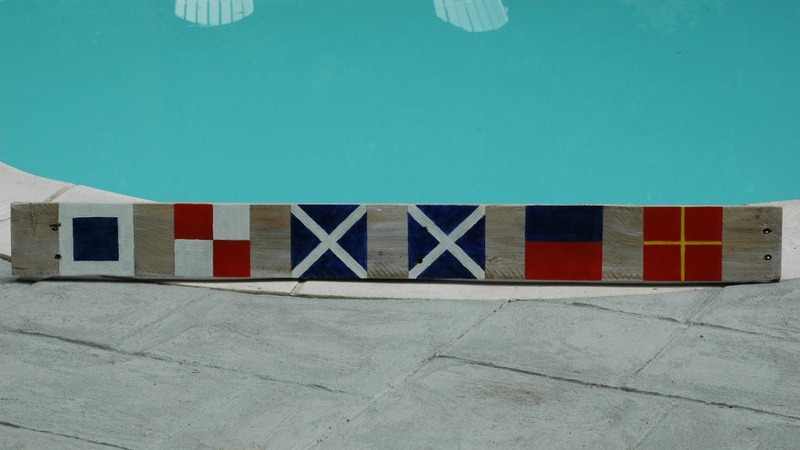 In maritime speak, the flags spell SUMMER. If you’re uninitiated, The International Code of Signals is a means of communicating important messages (either with the use of signal flags or spoken language over a radio) about safety and/or navigation while at sea. Dating back to 1855, the maritime alphabet is comprised of the standard 26 letters A to Z and includes a spoken form of each letter to avoid confusion of letters that sound similar. On the radio, SUMMER would be spoken: Sierra Uniform Mike Mike Echo Romeo. Want to know how I did it? It was pretty easy actually, just a bit tedious and time consuming. As always, Brian did the heavy lifting so to speak and removed the plank from an old pallet we had left from another project. I cleaned the board with a bit of soap and water and allowed it to air dry before sanding any rough edges and splinters left behind from the nails. Next, I mixed some white paint with water until it was thin enough to go on as a whitewash. TIP: I wash and save old jars from olives/salsa/pesto to mix paint in. You can screw the lid on after you’re done and save it for another project. Next time you use it, gently shake the jar and you’re good to go. I copied the flags for each letter and pasted them, in order, in a Word document and then printed it as a reference before I began painting. I looked at it no less than 100 times to make sure I had the right flags and that they were in the correct order. To space the flags, I used square stone tile coasters because they were exactly the same width as the board (4 inches). I placed them on the board and measured to make sure there was 2 inches between each coaster. Then I traced them to get the sides of each flag. The top and bottom of each flag would be the edge of the board. The main issue I had with spacing the flags was the off-center nail holes in the middle of the board. They landed in the second “M” which wasn’t ideal but I didn’t really want to fill the holes because I didn’t think it would like right. So, the nail holes are in the “M” of summer. 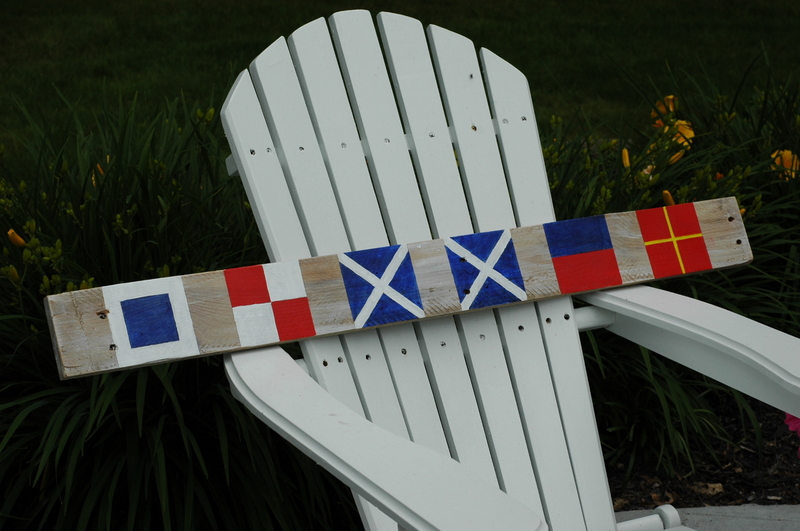 I used a ruler to measure out the pattern of each flag (this was the tedious part …) and drew a faint line with a pencil. I painted the flags with acrylic paint and once completely dry, I applied 2 coats of Liquitex acrylic varnish to protect the flags. 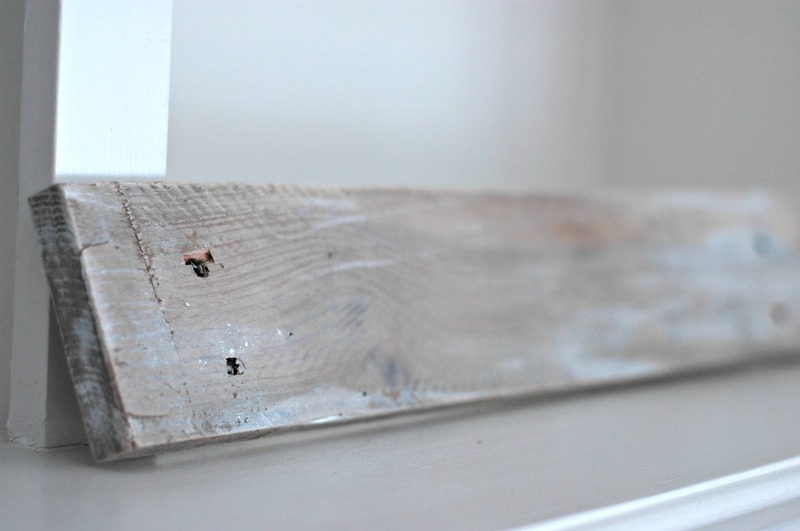 I did not apply anything to the whitewashed wood because I didn’t want it to have a sheen. This nautical sign is perfect for a beach-side summer home. We can’t wait to see it in their new home!